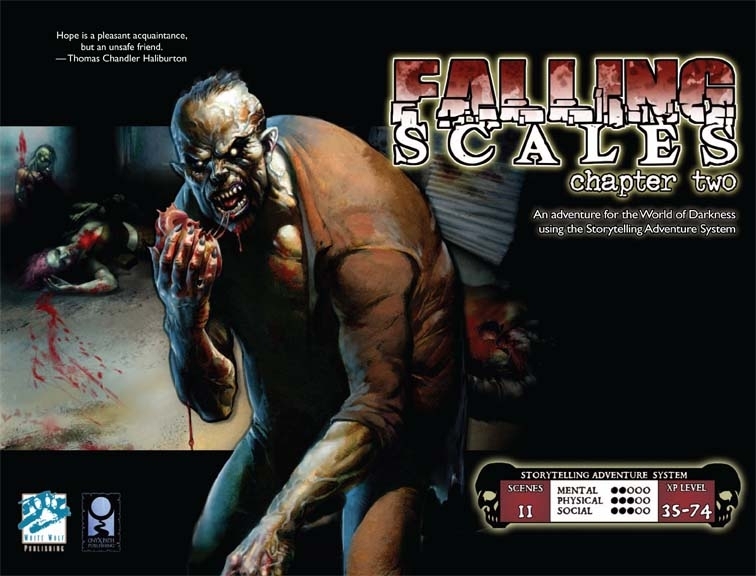 Our game design essay series continues today with some notes from Monica Valentinelli, author of Falling Scales Chapter Two, a World of Darkness SAS from White Wolf. Falling Scales Chapter Two is the final, and second installment, for Falling Scales Part I. I started working on this project last Fall under the assumption that this would be a more atmospheric piece to further introduce a global conspiracy. While there were elements I was able to draw upon, the plot was directed, and there were some liberties I was not allowed to take. One example of the boundaries I had, was the books I could draw from. Primarily, I had to utilize core World of Darkness books and ensure that I didn’t grab from too many of them. The idea was that Storytellers wouldn’t be required to pick up all the additional ephemera, but there was a lot of material I could (and did) draw from within the suggested word count. These types of guidelines, for any of you who freelance for the RPG industry, is part of the development process. Some companies will let you go willy-nilly; others have a clearer vision. Working with White Wolf has been, in my experience, the latter. Set in Washington D.C., the plot revolving around the mimetic virus for Falling Scales Part II involves the Vice President and his connection to White Heart Pharmaceuticals. Given the word count limitation, the ins and outs of the city, coupled with the inner-workings of politics, were not the main focus. Mind you, these are very heavy and very deep topics, so don’t be afraid to research the area on your own and drop in as much flavor as possible. The politics part was less about the inner workings, primarily for logistics purposes, and more about the depth of the conspiracy and visibility of the players involved. In other words, Falling Scales Part II was meant to be urban fantasy rather than an ultra-realistic adventure. Here, I bridged the gap between the first and second parts through one of the Antagonists should a Storyteller want to draw upon that. There is enough here for a Storyteller to download as is, but I do feel it’s stronger if you use it with the first part. I also feel this could be drawn out depending upon how deep you want to allude to the horror here, which is why I suggest reading this a few times before you run it. It’s jammed with hints and allusions to other threads. As Rich already pointed out on the White Wolf forums, Falling Scales Part II was supposed to be the second part of a four-part series. I first heard about that news late in the process. This had an impact on the first and the second (e.g. my portion) of the adventure, because I was working within a specific framework believing that there would be two more pieces swelling to an epic conclusion after mine. For me to rewrite Part II based on that conclusion, I’d have to re-plot (and re-pen) the adventure under a developer’s guided vision. Mind you, that also meant potentially renegotiating contracts and a delayed publishing schedule. On White Wolf’s end, a new business model didn’t make a lot of sense, so I tweaked this without sacrificing the developer’s vision. After the news debuted, I made a few changes to end the adventure, but I did nothing to seriously impact or alter the story as it was. 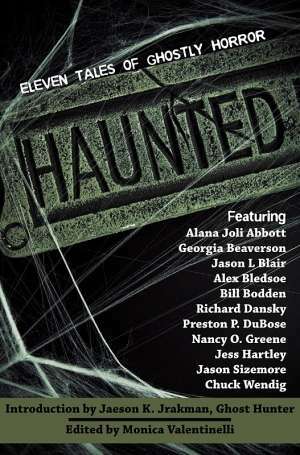 I dropped in a creature from World of Darkness: Antagonists who I felt best fit the feel of the overall story and who had something to gain from the mimetic virus. That, was always, really important to me. That everything had a place. While there’s room for interpretation (you can always ask me directly if you ever want to know more about what I wrote), there still had to be a lot of launch points here since it had to be compatible with every game line. The story was new territory for White Wolf not because it was based on a conspiracy, but because this concept was initially planned to reach epic proportions. That idea had to be handled with a lot of care, because there’s ramifications for each game line and on the mortal level as well. 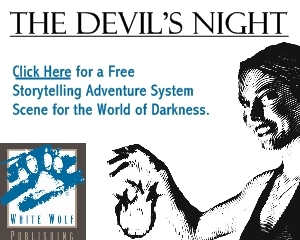 Even though it was cut short, I hope everyone understands I did as much as I could to make this an enjoyable scenario and give you new ideas to draw from for your World of Darkness games.